Club foot (also called talipes) is a birth defect that can affect one or both feet. Early treatment usually helps correct it. If your baby has club foot, one or both feet points down and inwards with the sole of the foot facing backwards. Club foot isn't painful for babies, but if it isn't treated, it can become painful and make it difficult to walk as they get older. Club foot is quite common, affecting about 1 baby in every 1,000 born in the UK. Both feet are affected in about half of these babies. Club foot is usually diagnosed after a baby is born, although it may be spotted in pregnancy during the routine ultrasound scan carried out between 18 and 21 weeks. Club foot can't be treated before birth, but picking up the problem during pregnancy means you can talk to doctors and find out what to expect after your baby is born. Some babies are born with normal feet that are in an abnormal position because they have been squashed in the womb. The feet usually correct themselves by 3 months, but some babies may need a few sessions of physiotherapy. Treatment for club foot usually starts within a week or two of your baby being born. A technique known as the Ponseti method is the main treatment for club foot nowadays. This involves gently manipulating your baby's foot into a better position, then putting it into a cast. This is repeated every week for about 5 to 8 weeks. After the last cast comes off, most babies need a minor operation to loosen the tendon at the back of their ankle (Achilles tendon). This is done using a local anaesthetic. It helps to release their foot into a more natural position. 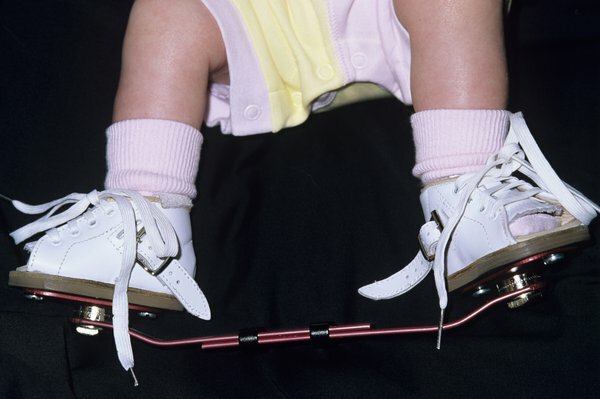 Your baby will need to wear special boots attached to each other with a bar to prevent the club foot returning. They'll only need to wear these full-time for the first 3 months, then overnight until they're 4 or 5 years old. Nearly all children treated with the Ponseti method will have pain-free, normal-looking feet. Most learn to walk at the usual age and can enjoy physical activities, including sports, when they're older. Children who only have one affected foot may be left with a slightly shorter leg and smaller foot on one side. This may mean your child is slightly less mobile and gets tired more quickly than other children. Before the Ponseti method, club foot was often treated with surgery to alter the position of the foot. This wasn't always effective, and led to long-term pain and stiffness for some adults. Sometimes club foot can come back, especially if treatment isn't followed exactly. If it comes back, some of the treatment stages may need to be repeated. In most cases the cause of club foot isn't known, but there may be a genetic link as it can run in families. If you have one child with club foot, your chance of having a second child with the condition is about 1 in 35. If one parent has club foot, there's about a 1 in 30 chance of your baby having it. If both parents have the condition, this increases to about a 1 in 3 chance. In rare cases, club foot is linked to more serious conditions, such as spina bifida. The charity STEPS offers help and support for families of children with club foot, and also adults who were born with club foot. Call their helpline on 01925 750271 or email info@steps-charity.org.uk. If your child has club foot, your clinical team will pass information about him or her on to the National Congenital Anomaly and Rare Diseases Registration Service (NCARDRS).